Contrary to popular notion, Verizon has started to seed the Android Oreo update to Google Pixel phones on its network much before any other major US carrier has initiated the process. Verizon has started rolling out the latest Android 8.0 Oreo update to Google Pixel and Pixel XL smartphones on its network. Google started to officially rollout the Android Oreo update to the Nexus 5X, Nexus 6P, Pixel C, Pixel and Pixel XL phones starting August 21. We are getting reports that Verizon and even Sprint has started roll out of Android Oreo to the Pixel and Pixel XL phones on their respective networks. 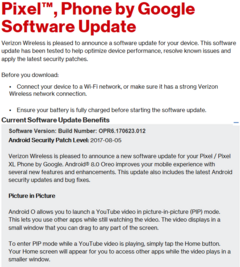 The update version listed on Verizon's support page is OPR6.170623.012 with Android security patch level 2017-08-05. Generally, it takes quite a bit of time for carriers to roll out any new OTA OS update. OEMs also take their own sweet time to finalize new software updates long after they are made official. For a change, it is glad to see Verizon being one of the first to seed the update to compatible handsets on its network. To ensure a hassle-free update process, Verizon recommends connecting to a Wi-Fi network or making sure the device has a strong Verizon Wireless connection. The carrier also recommends the battery be fully charged before starting the update process. Android Oreo comes with some nifty new features such as Picture-in-Picture, a more user-friendly notification centre, notification badges on app icons, always-on display, instant apps and a lot more under-the-hood performance and security improvements. Those comfortable with manual flashing can also download the Android 8.0 system images for their corresponding handset from the Android Developers website. We'll be sure to keep you posted as and when Android Oreo is available on other carriers and OEMs so watch this space.